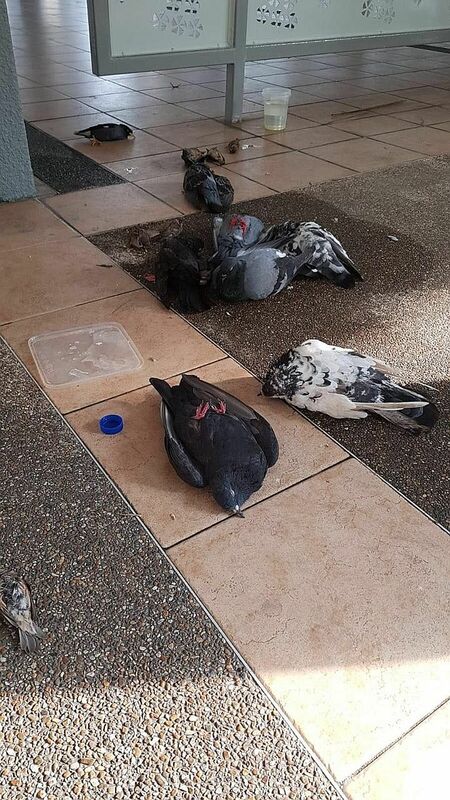 Residents of Block 390 Bukit Batok West Avenue 5 have raised concerns after some 15 birds were found either dead or dying at their void deck yesterday. Residents told The Straits Times the birds that were still alive were fighting to move and gasping for air. Policemen cordoned off the area last night. Madam Julie Harichand, 57, a housewife, said she was on her way home at about 3.30pm when she saw the birds scattered around the void deck. Some were still alive. She said she and a group of 10 residents then carried the birds and placed them together. She said: "I think someone must have poisoned the birds. Those that were alive kept trying to fly and failing. We gathered the birds together so we could give them water, and while doing so we found what looked like white rice in their mouths. "The birds seemed to be fighting for their lives; the small sparrows looked like they were gasping for breath," he added. "If the birds were poisoned, how could someone do such a thing? They are so pitiful."